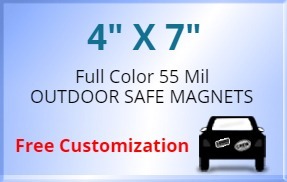 4x7 Customized Magnets - Outdoor & Car Magnets 55 Mil Square Corners are a stunning promotional resource to display your promotional tagline in full glory before people. Being outdoor safe, these printable magnets can be placed on cars as well as in other outdoor areas where there is a metal surface. 55 Mil thickness makes them stronger and durable, thus assuring longer brand exposure. Facilities like free design, lowest price guarantee and no set up fee makes these custom rectangle and square magnets more valuable. Order these American made magnets today to get free shipping in the Contiguous USA. Request a quote to know wholesale savings for these 4x7 Customized Magnets - Outdoor & Car Magnets 55 Mil Square Corners.